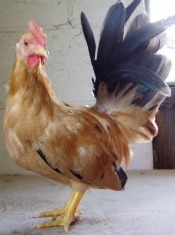 The Japanese Bantam chicken breed is a strictly ornamental bantam breed that is well liked by poultry fanciers. It is a a showy breed with a long tail that stands upright. Size: Male: 26 oz. Female: 22 oz. Comb, Wattles & Earlobes: Their comb, wattles, and earlobes are generally large in males and medium-size in females. The comb is single with five well defined points that stand upright. The white bearded variety has very small wattles. They are all bright red in color. Color: Their beak is in shades of yellow and the eyes are dark brown or reddish bay. The shanks and toes are in shades of yellow. Black-Tailed Buff: Their plumage is primarily buff and the tail is black with some buff lacing. The wings are mainly buff with some black. Black-Tailed Red: They have standard black-tailed red plumage. 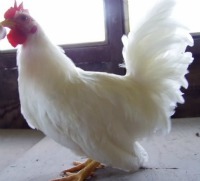 Black-Tailed White: The plumage is primarily white to silvery white and the tail is black with some white lacing. The wings are mainly white with some black. Brown Red: They have standard brown-red plumage. Self Blue: They have standard self blue plumage. Silver Duckwing: They have standard silver duck wing plumage. Silver Laced: They have standard silver laced plumage. White Bearded: Their beard is composed of feathers directed downward from under the beak and the muffs consist of feathers turned horizontally backward from both sides of beak. They have standard white plumage. Special Qualities: A truly ornamental bantam breed. 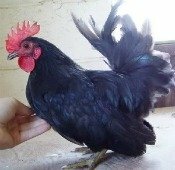 This truly bantam breed is a very showy bird. It has a very long tail that stands upright and a large comb that also stands upright. This gives the bird the look of a V when viewed from the side. The breed has very short legs and long wings that are held at an angle so they touch the ground. These birds are credited with being developed in Japan where they were known as the Chabo breed, which means "dwarf" or "bantam." They appear in Japanese art as early as 1635 and in Dutch art not too much later. They are believed to be older than that and to have arrived in Japan from China in the early 1600's. They were originally bred from Malaysian stock and were intended to be a garden bird for the upper class of Japanese society. The Japanese Bantams are a very popular breed. The ABA considers them to be in the top ten most popular breeds of all breeds. They do present some challenges though that should give pause to those new to the chicken game. Breeding these birds for good show form is very difficult and almost an art. The commercially available birds very often do not meet the standards. To keep their plumage in good shape the birds must be kept in pristine dry bedding and only allowed outside in dry weather as any dirt or manure that accumulates on their feathers will stain or shred the ends of their feathers. They do not do well in cold weather and must be kept in a tight and warm coop during winter (with supplemental heat if it is extremely cold). Otherwise, the breed is a very easy going bird that is tame and gentle. In warm dry weather they are good foragers and good fliers. The hens lay a fair amount of small brown eggs, go broody, and are good mothers. The Japanese Bantam was first admitted to the APA in 1914.